… Bed & Breakfast in Paris did not exist and customers could not be found on the web : Yahoo had been launched two years before and Internet Explorer was just born but Google was still in preparation. At this time bookings were made over the phone or by mail and one did not need dozens of pictures or customers’ reviews before making one’s choice. Our guests trusted us because we were a professional intermediary who had selected its hosts and rooms with much care for their quality of comfort and surroundings and their excellent welcome. I have created and developed Bed & Breakfast in Paris because I believed deeply that this kind of accommodation was as relevant in towns as in the countryside and that the meeting of Parisian people providing a warm and thoughtful welcome, some help when needed and personalized advices could improve the experience of a Parisian stay and make it unforgettable. I still believe it. 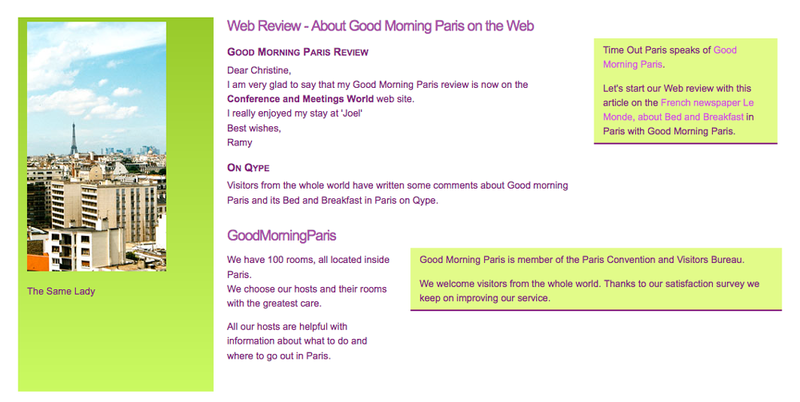 The first website of Good Morning Paris was created in 1999 ; it has been changed and improved every five years or so since then. In 2012 the Facebook page of Good Morning Paris was born and the guidebook : “Chambres d’hôtes pas comme les autres à Paris” published. 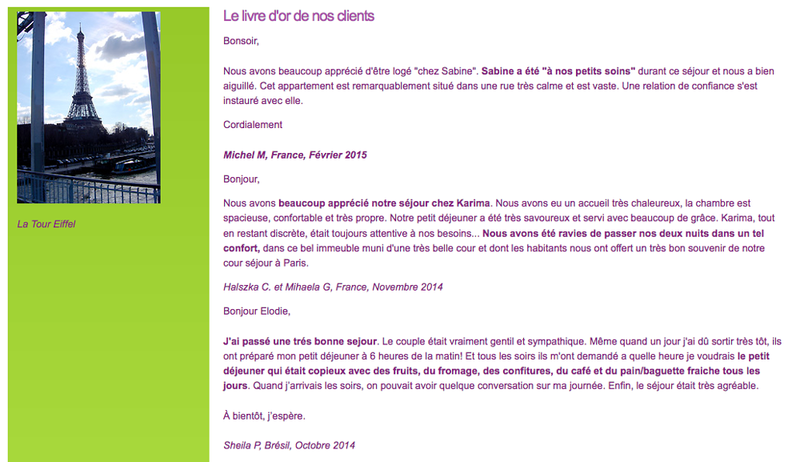 In 2013 the instant online booking was implemented on the webiste. And in 2015 I launched Good Morning Paris The Blog. For twenty years Good Morning Paris has been the instigator of an authentic tourism in Paris. 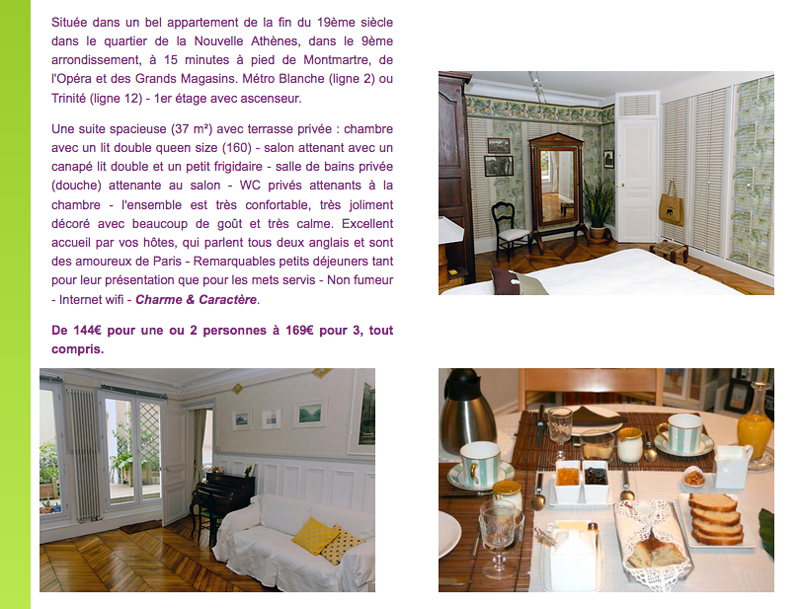 Since 1996 we have been welcoming visitors from the whole world in quality charming Bed & Breakfasts in central Paris. Thanks to us tens of thousands of encounters between Parisians who love their city and visitors looking for a warm, personalized welcome and an authentic discovery of Paris have occured. We have helped our guests to discover Paris as a Parisian, to be welcomed by friendly and thoughtful hosts in beautiful apartments or houses and to enjoy otherwise their stay in our unique city. Good Morning Paris closed in December 2016 : we do not offer any longer our Bed & Breafasts as we could not resist the competition with Airbnb. Nevertheless Good Morning Paris The Blog still exists and meets the same purposes : Sharing my love for Paris and my discoveries and ideas to enjoy otherwise the city, whether you are a Parisian or a tourist in Paris. I invite you to visit it and wish you a pleasant journey through Paris, the Paris that I love since I was born there more than fifty years ago.